Predicting the outcome in this one? You may as well flip a coin. Hearts tend to be favourites whenever their city rivals cross town, even in times where Hibs have been better on the eye, have more wins under their belt etc etc. The Jambos always find a way to raise their game, or at least snuff out the the Easter Road side’s main threat. Yes the hosts are likely to have Uche Ikpeazu back leading the line, Hibs will be expecting his return. But he can’t beat Paul Heckingbottom’s men single-handedly. Hibs carry a greater threat going forward and if they can win their individual battles, I see Edinburgh being bathed in green and white this weekend. Prediction: Hibs win. The Edinburgh derby. Football’s burial ground. Those turning up to Tynecastle or tuning in at home will likely know not to expect a scintillating game of football but there should be entertainment. The steady, consistent progress of Paul Heckingbottom’s Hibs travel to face Craig Levein’s stuttering Hearts. 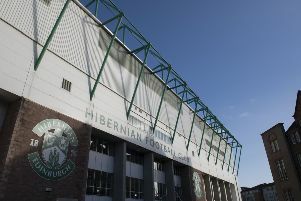 Since the Englishman’s arrival at Easter Road they have clawed back ten points on their rivals and have the perfect chance to end their recent hex against Hearts in Gorgie and jump up them, putting a marker down for the top six and a run at third. Hearts need the three points so both players and fans are going into the Scottish Cup semi final against Inverness CT on a high. The battle between Uche Ikpeazu and Darren McGregor should be fascinating. If there is a winner out of that duel then that could decide the game, while a potential return for Michael Smith would be huge for Hearts. That being said it is hard to separate the teams. Prediction: Draw.